The NFL’s current rules on having one helmet won’t affect the 49ers if they were to go this route. The 49ers would simply swap the logo decal on the helmet and that would be set. Their current set is very similar to their old school uniforms, meaning that a throwback set would not be hard to reproduce. In fact, the Bengals could join in on the fun. Their helmets have not changed since those two Super Bowl games and they could also wear throwbacks for the game. 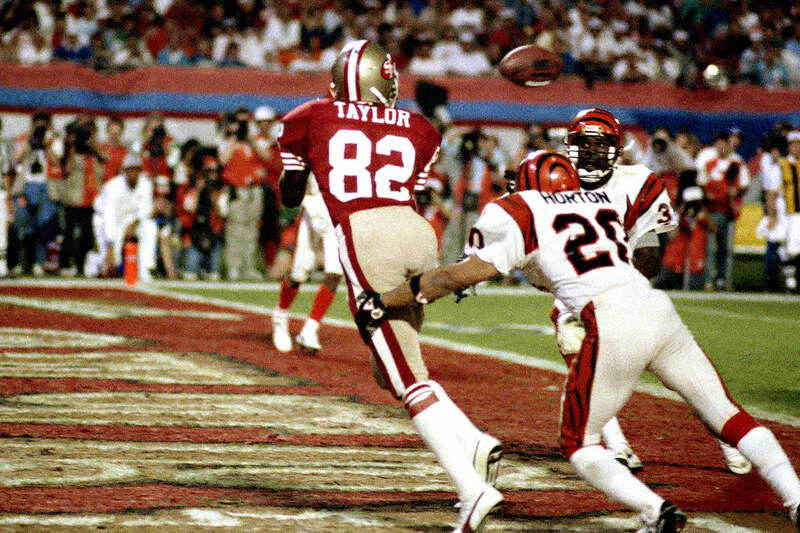 With the 49ers as the home team, they would wear red and the Bengals will be in white. It would perfectly match their Super XXIII matchup. Unfortunately, it looks very unlikely that the 49ers and Bengals would go this route. If they were going to throwback route, they would have marketed it on social media by now. They have not done that. As much as it is great that the 49ers are going old school with their field, it’s a shame that all signs point to them just doing that and not altering their uniforms. This entry was posted in Cincinnati Bengals, NFL, Old Sets, On-field designs, San Francisco 49ers, Uniforms & Design and tagged Throwback. Bookmark the permalink.